Education remains a vital tool in combating the opioid and heroin epidemic wreaking havoc in New Jersey and across the nation. On Thursday May 4 at the Ocean County Library in Toms River and May 9 at Ocean County College you'll have another chance to learn more about current prevention and treatment efforts ongoing. Political Science Professor at OCC Jennifer Barnes says 'The Substance Abuse Summit' is an educational forum focusing on prevention and treatment. "It's an eye-opening experience for family members that believe, 'well it couldn't be my child'," said Barnes. "What I've learned in this experience is that it 'can be my child and these are (the signs) I need to be looking for'." She urges parents and even grandparents to attend and discover how to detect the signs of addiction within their own family. "When your grandchildren come over, just take inventory of the medication that you have," said Barnes. "If someone's addicted the first thing they're going to do is go into your medicine cabinet and see what you have." The summit will be split into two programs running at the same time, she adds, but all members of the community are invited to attend. "We have one that's catering to the high school students in the area and the superintendents," said Barnes. "That one will include a viewing of a documentary by Toms River Author Alicia Cook." Students will then join members of the community for a panel discussion which includes recovering addicts, health professionals and local law enforcement. Among them will be Alicia Cook but also Shore Congressman Tom MacArthur (D-3) who is also the Co-Chair of the Bi-Partisan Heroin Task Force in Washington D.C.
"He's been an elected official that I think Ocean County has come to rely upon in terms of trying to get to the bottom of this problem and try to get rid of it," said Barnes. Joining Cook and MacArthur on the panel will be Ocean County Sheriff Mike Mastronardy and Prosecutor Joe Coronato. The high school students will begin the first installment of the program at 8 am in the Novins Planetarium then join the community in the second part of the program which begins at 9 am in the Gateway Lecture Hall. Free admission is available to attend this critical educational event. The students will be able to ask Alicia some questions post-documentary as well. "We're hoping that we make some kind of an impact with this summit," said Barnes. "Even if it saves one life, that's a success." This will also include a panel of local law enforcement and health professionals and is designed to educate the public on the current state of the drug epidemic and how we can climb towards a solution. 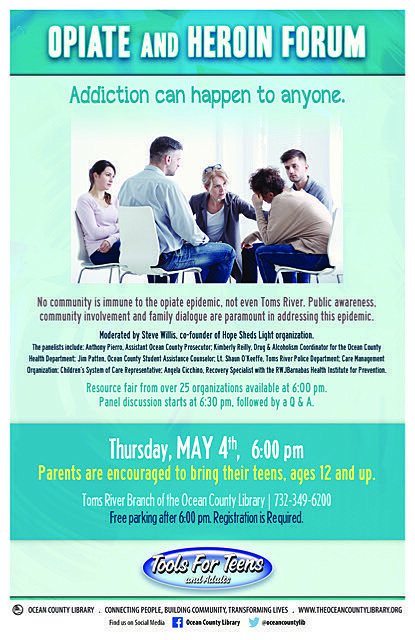 Panelists for the library event include: "Anthony Pierro, Assistant Ocean County Prosecutor, Kimberly Reilly, Ocean County Drug & Alcoholism Coordinator for the Ocean County Health Department, Jim Patten, Student Assistance Counselor for Toms River High School North, Lt. Shaun O’Keeffe, Toms River Police Department, and Recovery Professionals from the Toms River community. The Forum will be moderated by Steve Willis, co-founder of the HOPE Sheds Light organization." Free admission is offered but officials insist you sign up beforehand.